ES File Explorer seems to be losing touch with its users. 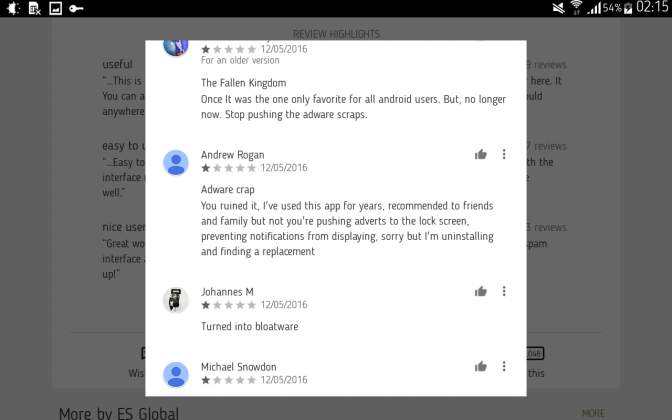 The renowned (soon to be notorious) file explorer has been under heavy criticism since late 2015 for adding bloatware, but the latest update might just be the last drop that sends it to the uninstall bin for many Android users. Now, ES File Explorer comes bundled with what appears to be a stripped version of DU Booster, which turns on a charge lock screen when you charge your device. 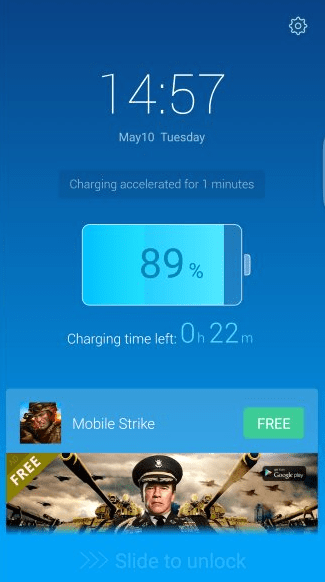 Besides the fact that it does NOT charge your phone 20% faster, as it suggests, the charging lock screen also puts a glaring ad banner at the bottom of the lock screen. Right there, where many users tend to swipe to unlock, and end up activating the darn ad banner. 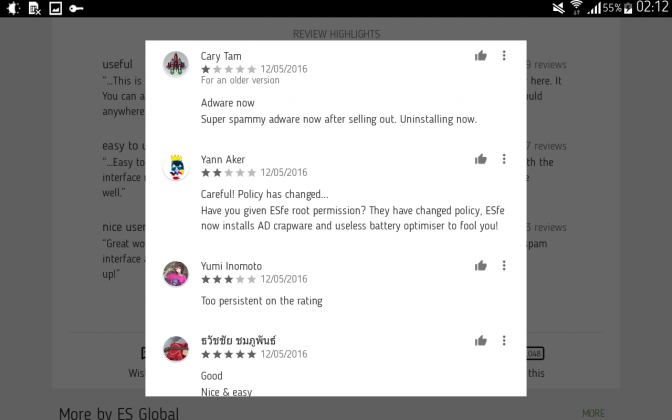 Baidu browser is also known as DU Browser, and the wealth of associated DU apps were most likely built using the same SDK kit. The apps belonging to the family are DU Browser, DU Launcher, DU Battery Saver, DU Speed Booster, ES File Explorer and some others. 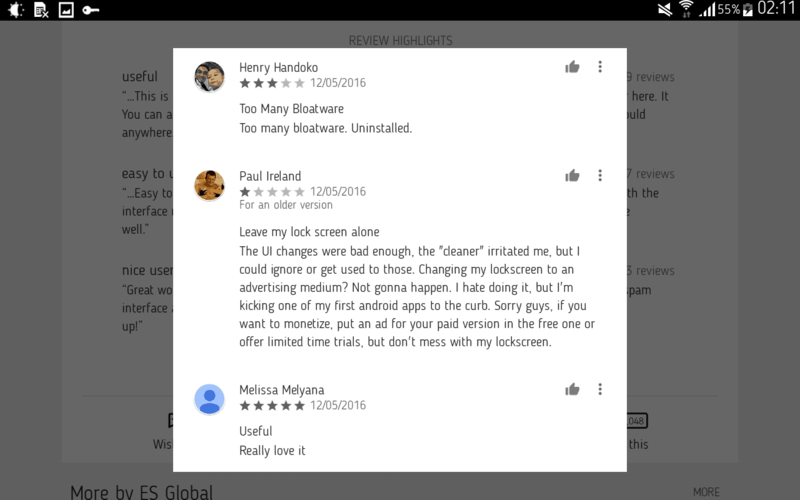 Emotions aside, placing ads on a lock screen violates Developer Agreement as in “Interfering with Apps” as it displays ads outside the app itself. Besides, displaying ads on a lock screen certainly drains more resources during a charge than it saves. When I uninstalled DU Battery Booster several months ago, I did it because it did not charge my device’s battery faster. I found Samsung Touch Wiz’s task manager and task killer feature a lot more efficient in this regard. 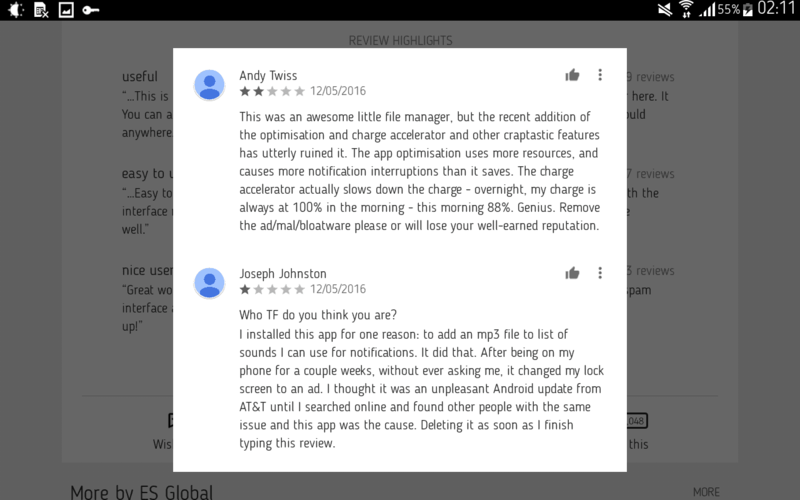 Besides, a wealth of additional apps masquerading behind a “feature” of the said booster app did cause a lot of frustration, when you tap thinking you’re activating a feature but the app opens Google Play store for you to download yet another app. 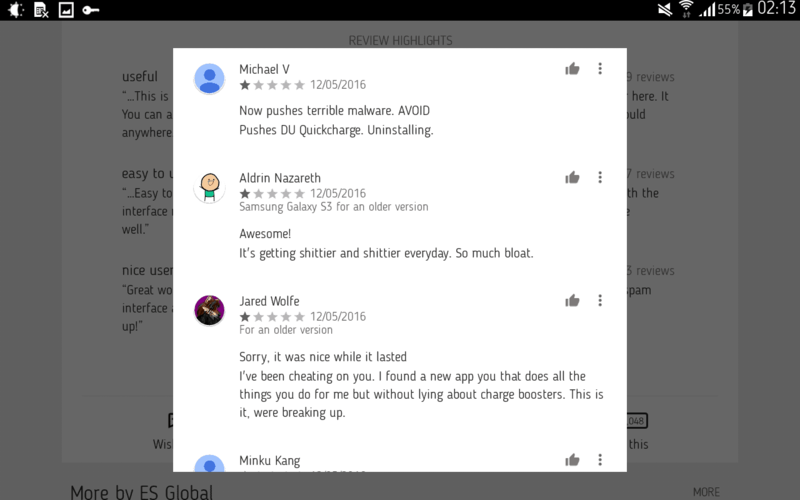 That said, ES File Explorer does come in a paid version worth $3 that removes ads. Some loyal users bash those who complain about the adware for wanting to get a premium app for free and without ads. The truth is, the way the ads appear on a charging lock screen is an intrusion and a major breach of user trust. Besides, the bogus “bonus” fast charging functionality of the ES File Explorer comes at a cost of additional resources and storage. Anyone who remembers ES File Explorer in its early days will tell you the staggering difference between the app of now and then. 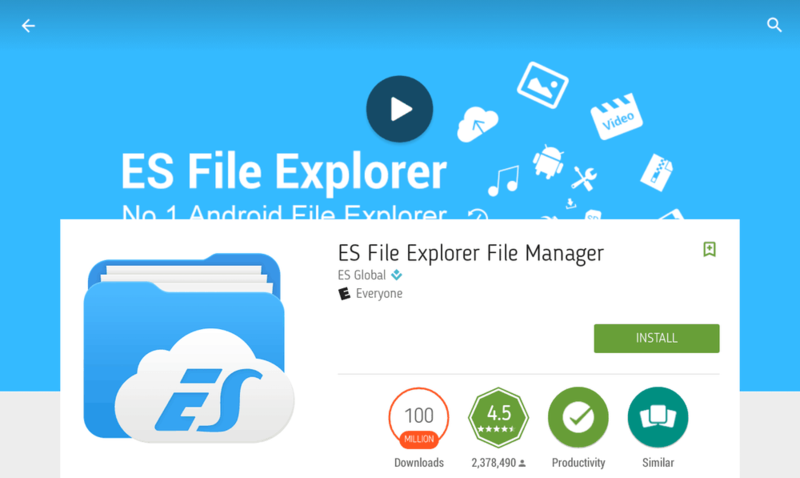 In the times when the competition is getting tougher by day and Android file explorers galore, ES File Explorer might have crossed the line this time. In addition, the early testers of Android N Preview suggest Google is bringing a native file manager with more or less decent feature set to Android N, so in the long run, ES File Explorer might lose quite a lot of its 5 million users. With security and privacy being nagging issues with Android OS, shady practices like these do not instill user trust. Are you using ES File Explorer? Have you updated to the last version, yet? Does the adware on the lock screen seem annoying or intrusive to you? If you’re thinking of jumping ship, my colleague Alexandra has compiled a list of great Android file managers for you, check it out! Don’t forget to follow PocketMeta on social networks for more apps and games reviews, roundups and awesome guides. Stay tuned!